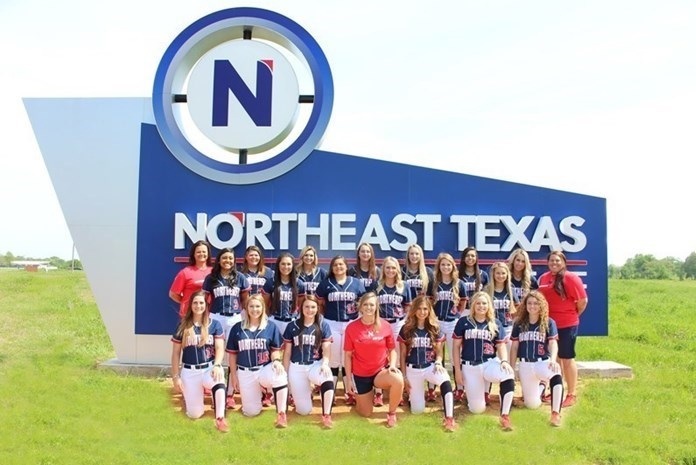 Northeast Texas Community College (12-22, 7-11) softball traveled to Bossier Parish Community College (32-14, 8-10) on Wednesday and came away with a sweep of the Cavaliers. Game one of the day would go to extra innings with the Eagles winning 9-8 in nine innings. Game two saw NTCC stay hot in an 11-5 victory over BPCC. NTCC took the lead in the top of the ninth to lead them to a 9-8 win. The game was tied at four with the Eagles batting in the top of the ninth when an error scored two runs for NTCC. The Eagles got things moving in the first inning after Macee Hollins, and Ramzi Smith (East Texas Baptist University commit) reached base with singles, then Haylee Wilson homered on a 1-2 count, scoring three runs to give NTCC a 3-0 lead. BPCC climbed back into the game scoring one run in the second, third, and fourth innings to tie the game at 3-3. Both teams would each add runners in the sixth inning to keep the game tied at 4-4. NTCC outscored Bossier in the ninth inning to take the win. Jamie Franks, a Hardin Simmons University commit, led things off in the circle for NTCC. Franks took the win after pitching eight innings, allowing eight runs on eight hits and striking out two. Kara Carter would come in relief in the ninth inning to pick up the save for the Eagles. NTCC homered twice on the day. Korbyn Bassett put the Eagles ahead for good when she went deep in the ninth inning to go along with Wilson’s three-run shot in the first. The Eagle batters collected 11 hits on the day. Blakelea Nettles, Wilson, Hollins, and Raylei Merrell each collected multiple hits for NTCC. Nettles went 3-for-5 at the plate to lead Eagle Softball in hits. Game two of the day saw the Eagles explode for five runs in the first inning to set the tone for the second game of the series. NTCC sent eight batters to the plate in the opening frame to score the five runs on five hits and one error. Kara Carter went the distance in Game two to pick up the win against BPCC. The Eagles bats remained hot in Game two, and Brooklyn Manes led off the second inning with a solo shot to the left. NTCC would add one more run in the second inning when Blakelea Nettles scored on an error after drawing a walk. NTCC added two more runs in the fifth inning, and one each in the sixth and seventh innings to defeat Bossier 11-5. Shelby Baker (Hardin Simmons University Commit) led Eagle Softball with three hits in four at-bats. Nettles reached base four times in the game with a single and drawing three walks. NTCC will continue conference play when they travel to Corsicana to play Navarro College on Friday. Here is our tentative schedule for the week due. It is subject to change due to the potential severe weather overnight Wednesday. Monday (Apr 22) TCS at NTCC at 2:00 pm with two seven-inning games.